DETAILS Join us on Saturday April 6th for a great night of comedy, music and dance with Alex Moreno Y Herencia De La Bahia. Groupo Polvo Y Plomo and comedy presented by our fabulous local comedian Miguel Saldaña. This is an event for 21 and over only. Beer, wine, cocktails and tacos available to buy. Tickets Tickets can be purchased for $20 in the following places: The Bald Barber 6945 Lone Tree way or Sweet Sugar 7860 Brentwood Blvd. For more information, you can call 925/595-5736 or visit our website at genuineupscale.com. Únase a nosotros el sábado 6 de abril para una gran noche de comedia, música y baile con Alex Moreno y Herencia De La Bahia. Grupo Polvo y Plomo y Comedia presentado por nuestro fabuloso comediante local Miguel Saldana. Este es un evento para mayores de 21 años . Cerveza, vino, cócteles y tacos disponibles para comprar. 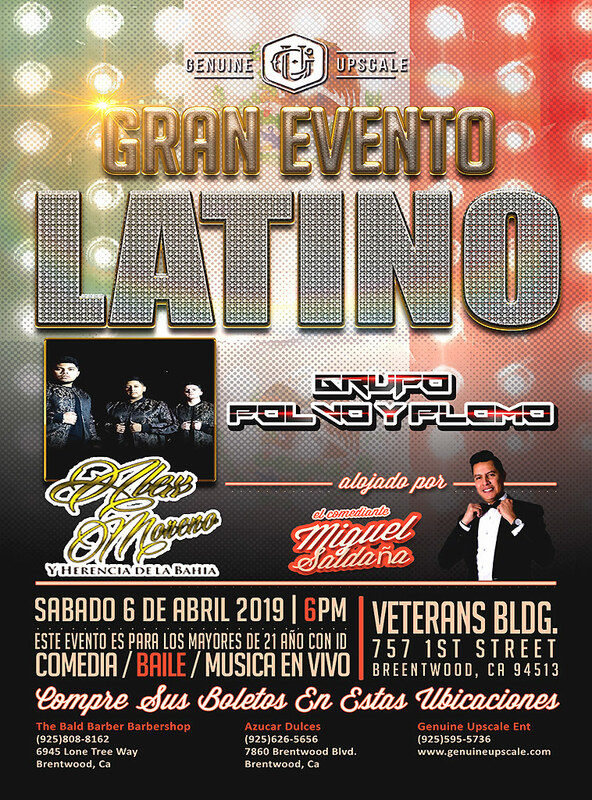 Los boletos Los boletos se pueden comprar por $20 en los siguientes lugares: The Bald Barber 6945 Lone Tree Way o Azucar Dulces 7860 Brentwood Blvd. Para obtener más información, puede llamar al 925/595-5736 o visitar nuestro sitio web en genuineupscale.com. Date/Time: April 6th at 6 p.m. Location: Veteran’s Building 757 1st Street Brentwood, CA 94513.